WWF began working in Argentina in 1988, when Fundación Vida Silvestre Argentina (FVSA) became an associate of WWF. Together, they held joint campaigns, arrange global actions and receive financial backup for executing programs and projects. They also exchange information and news on a periodical basis about environmental issues. Since 1987, the FVSA has established 12 wildlife refuges covering 55,000 ha. Currently, with the support of the WWF, the FVSA is working toward forest landscape restoration in the Atlantic Forest ecoregion, which is one of the richest forest habitats in Argentina. The FVSA is also working to protect Argentina's largest wetlands, the Iberá Marshes, from rising water levels due to the Yacyretá dam. In addition to promoting forest certification and freshwater conservation, the FVSA is also involved in the promotion of energy resource management, environmental education, and the establishment of marine and inland-protected areas. Monte Leon covers 60,000 hectares of Patagonian steppes and stretches approximately 25 miles off the South West Atlantic coats - about 1% of Argentina's coastline. Its name, which means Lion Mountain, comes from a coastal mountain that resembles the profile of a lion. The puma, or mountain lion, still lives there. The area has also ancient sea caves, kelp forest, sea lions, penguins, cormorants, and guanacos. In May 2001, with the financial support of The Patagonia Land Trust and WWF, FVSA bought Monte Leon, and then in November of 2002 donated it to the Argentinian National Parks Administration to create the first coastal Patagonian protected area. A management plan for the future Monte Leon Marine National Park has already been designed. The administration committee includes: National Parks Administration, Santa Cruz province, Fundación Vida Silvestre Argentina, and the Patagonia Land Trust. The yaguareté or jaguar is the biggest feline in the American continent. Originally this species home range spanned from the south of the United States to the north of Argentina. Today it occupies less than the half of this area. One of the biggest challenges for jaguar conservation is to maintain the genetic exchange of the populations in that region. FVSA scientists are working to resolve the issue of jaguars killing cattle (without killing the jaguars) by establishing barriers so that jaguars are not able to reach their prey. Misiones is part of the largest continuous remnant of Atlantic Forest left in this highly threatened ecoregion. Nowhere else in the Americas can you see so much of the Atlantic Forest, along with one of the largest and most spectacular waterfalls in the world: The Iguaçu Falls. WWF (both in Brazil and Paraguay) and FVSA in Argentina have been working together to develop a plan to promote conservation and sustainable development in this region. This includes making about 1 million hectares of forest into a Green Corridor that would allow the establishment of sustainable forest management, ecotourism, and a wealth of small development projects that would ensure better use of the natural resources of the forest. Peninsula Valdes is characterized by its vibrant coastline, a stunning array of tall cliffs, rocky reef and exotic marine mammals. Peninsula Valdes is home to the southern elephant seal, sea lion, Southern right whale, and magellan penguins. In a spectacular display, in March and April each year, killer whales breach on the beach in prey upon sea lions pups. The peninsula is also the world's most important breeding ground for Southern right whales. This giant, beautiful creature arrives in April and leaves in December; as a result, whale watching has become a very important activity. Soy is a key crop and major source of income for Argentina, and cultivation of this crop is planned to expand further in the coming years. To ensure that this does not happen at the expense of vulnerable natural areas such as the Atlantic Forest ecoregion, WWF is working together with business, government agencies, and NGOs to develop responsible alternatives. One example of this is the promotion of palmito (heart of palm). In Argentina, wild grown palmito can be sustainably harvested while increasing the forest value and its productivity, as well as the landowners’ income. Results of a recent market study show that there is a potential market for sustainably harvested and locally canned palmito. Together with small farmers in the Atlantic Forest, WWF’s partner organization, Fundación Vida Silvestre Argentina, is developing this market as a viable alternative to forest clearing. In collaboration with companies, NGOs, and banks, WWF initiated the international Round Table on Responsible Soy (RTRS), to jointly develop solutions for responsible soy production. The objective is to promote economically viable, socially equitable and environmentally responsible production and use of soy. Diego Gonzales, 70 years old, climbs the 15 m tall palms to collect the seeds to ensure the regrowth of palmito (heart of palm) in the forest. 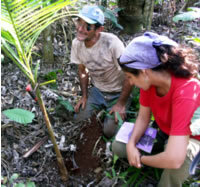 He is working with a researcher from FVSA to enhance/increase the germination speed of the palmito seeds. Palmito is harvested from several species of palm. Up to 1 m of heart of palm can be harvested from one plant. The species here in the Atlantic Forest dies when the heart of palm is harvested as the whole plant will have to be cut down. Other species regenerate after harvest, but the taste of the hear of palm is not as nice. What is WWF doing about the environmental impacts of agriculture globally?